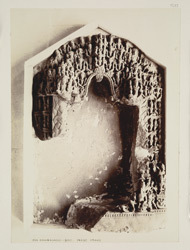 Photograph of a damaged image frame, carved with numerous small figures, from Brahmanabad in the Hyderabad District of Sind in Pakistan, taken by Henry Cousens in 1896-7. Cousens wrote in Brahmanabad-Mansura in Sind, Archaeological Survey of India, Annual Report 1903-04, "At one spot were found a great many fragments of Hindu stone images, one of which was the frame which surrounded an image, most elaborately carved with rings of little gods around the top and down the sides...Occupying the principal position on the frame, immediately above the place where the head of the image would have been, is Surya, with the lotus in either hand and wearing his long boots. To accentuate his importance the more, he is repeated on either side and above. On his right is Brahma, showing three of his faces, while, upon his left, is Siva with trident and snake. Above Surya is a little goddess, and Ganapati figures frequently. The frame, in all probability, encircled an image of Surya, whose worship was prevalent in this part of India."